Tsushima Island (対馬, Tsushima) is an island of the Japanese archipelago situated in-between the Tsushima Strait and Korea Strait, approximately halfway between the Japanese mainland and the Korean Peninsula. The main island of Tsushima was once a single island but was divided into two in 1671 by the Ōfunakoshiseto canal and into three in 1900 by the Manzekiseto canal. These canals were driven through isthmuses in the center of the island, creating "North Tsushima Island" (Kamijima) and "South Tsushima Island" (Shimojima). Tsushima also incorporates over 100 smaller islands (many tiny). The name Tsushima generally refers to all the islands collectively. The island group measures about 70 km (43 mi) by 15 km (9 mi) and had a population of about 34,000 as of 2013[update]. 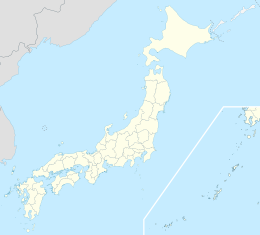 The main islands (that is, the "North" and "South" islands, and the thin island that connects them) are the largest coherent satellite island group of Nagasaki Prefecture and the fourth largest in Japan (excluding the main islands of Honshu, Kyushu, Shikoku and Hokkaido). The city of Tsushima lies on the Tsushima islands, and is divided into six boroughs. 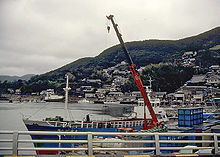 Tsushima Island is located west of the Kanmon Strait at a latitude between Honshu and Kyushu of the Japanese mainland. The Korea Strait splits at the Tsushima Island Archipelago into two channels; the wider channel, closer to the mainland of Japan, is the Tsushima Strait. Ōfunakoshi-Seto and Manzeki-Seto, the two canals built in 1671 and 1900 respectively, connect the deep indentation of Asō Bay (浅茅湾) to the east side of the island. The archipelago comprises over 100 smaller islets in addition to the main island. Tsushima is the closest Japanese territory to the Korean Peninsula, lying approximately 50 km from Busan. On a clear day, the hills and mountains of the Korean peninsula are visible from the higher elevations on the two northern mountains. The nearest Japanese port, Iki, situated on Iki Island within the Tsushima Basin, is also 50 km away. Tsushima Island and Iki Island are collectively within the borders of the Iki–Tsushima Quasi-National Park, designated as a nature preserve and protected from further development. Much of Tsushima (89%) is covered by natural vegetation and mountains. Tsushima Island has many mountains such as the Mt. Ohira, Mt. Yatate, Mt. Hokogatake, Mt. Koyasan, Mt. Ontake, Mt. Gogen. The Japanese government administers Tsushima Island as a single entity despite the artificial waterways that have separated it into two islands. The northern area is known as Kamino-shima (上島), and the southern island as Shimono-shima (下島). Both sub-islands have a pair of mountains. Shimo-no-shima has Mount Yatate (矢立山), standing 649 m (2,129 ft) high, and Ariake-yama (有明山), at 558 m (1,831 ft) high. Kami-no-shima has Mi-take (御嶽), 487 m (1,598 ft). The two main sections of the island are now joined by a combination bridge and causeway. The island has a total area of 696.26 km2. Tsushima has a marine subtropical climate strongly influenced by monsoon winds. The average temperature is 15.8 °C, and the average yearly precipitation is 2,132.6 mm. The highest temperature ever recorded on the island is 36.6 °C, on August 20, 2013, and the lowest –8.6 °C, in 1895. Throughout most of the year, Tsushima is 1 – 2 °C cooler than the city of Nagasaki. The island's rainfall is generally higher than that of the main islands of Japan; this is attributed to the difference in their size. Because Tsushima is small and isolated, it is exposed on all sides to moist marine air, which releases precipitation as it ascends the island's steep slopes. Continental monsoon winds carry loess (yellow sand) from China in the spring and cool the island in the winter. The rainy season begins and ends later than in other areas in Nagasaki Prefecture, and Tsushima rarely suffers direct hits by typhoons. The island is inhabited by the Tsushima cat, wild boar, deer, martens, and mice. Otters were discovered to be living in Tsushima in February 2017. Migrating birds that make stops on the island include hawks, harriers, eagles, and black-throated loons. Forests, covering 90% of the island, consist of broad-leafed evergreens, conifers, and deciduous trees including cypress. Honey bees are common, with many used to produce commercial honey. Tsushima Island pitviper is a venomous snake endemic (found nowhere else) to the Tsushima Island. Tsushima Reef, in the bay between Tsushima and Iki Island, is the northernmost coral reef in the world, surpassing the Iki Island reef discovered in 2001. It is dominated by cool-tolerant stony or Scleractinian Favia corals but the observed settling of tropical Acropora coral is expected to provide an ongoing indicator for continuing global warming. According to a 2000 census, 23.9% of the local population is employed in primary industries while 19.7% and 56.4% of the population are employed in secondary and tertiary industries, respectively. Of these economic activities, fishing amounts to 82.6% of the primary industry, with much of it dedicated to catching squid on the eastern coast of the island. The number of employees in the primary industries has been decreasing, while employee growth in the secondary and tertiary industries has been increasing. Tourism, targeting mainly South Koreans, has recently made a great contribution to the islands' economy. The number of Korean tourists to the island increased greatly after the launching of a high-speed ferry service from Busan to the island in 1999. In 2008, 72,349 Koreans visited the island. Due to a drop in the value of the won, the number fell to 45,266 in 2009. Korean tourists generate an estimated ¥2.1 billion in revenue for the local economy and generate about 260 jobs[clarification needed] on the island. The island will see around 200,000 visitors from Korea in 2013, surpassing the number of visitors from other parts of Japan for the first time. [clarification needed] Tsushima Airport serves the island. And the festival to interchange with Korea was aborted. In October 2012, five South Korean men broke into a temple and stole two statues, which had been on the island for more than three centuries, attempting to resell them for more than $1 million each. The men were apprehended in South Korea; however, the statues have yet to be returned by the Korean authorities. The theft and resulting tensions, however, has not slowed down Korean tourism on Tsushima. 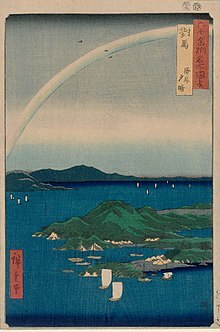 In Japanese mythology, Tsushima was one of the eight original islands created by the Shinto deities Izanagi and Izanami. Archaeological evidence suggests that Tsushima was already inhabited by settlers from the Japanese archipelago and Korean Peninsula from the Jōmon period to the Kofun period. The Sanguo Zhi, a Chinese historical text, describes a country called Duihai guo (simplified Chinese: 对海国; traditional Chinese: 對海國; Wade–Giles: Tui-hai kuo, Japanese: Tsuikai-koku) with a population of more than one thousand households, which is commonly identified with Tsushima. It was one of the about 30 that composed the Yamatai-koku union countries. These families exerted control over Iki Island, and established trading links with Yayoi Japan. Since Tsushima had almost no land to cultivate, islanders earned their living by fishing and trading. Under the Ritsuryō system, Tsushima became a province of Japan. This province was linked with Dazaifu, the political and economical center of Kyūshū, as well as the central government of Japan. Due to its strategic location, Tsushima played a major role in defending Japan against invasions from the Asian continent and developing trade lines with Baekje and Silla of Three Kingdoms of Korea. After Baekje, which was helped by Japan, was defeated by Silla and Tang Dynasty forces at the Battle of Hakusukinoe in 663, Japanese border guards were sent to Tsushima, and Kaneda Castle was constructed on the island. Tsushima Province was controlled by the Tsushima no Kuni no miyatsuko (対馬国造) until the Nara period, and then by the Abiru clan until the middle of the 13th century. The role and title of "Governor of Tsushima" was exclusively held by the Shōni clan for generations. However, since the Shōni actually resided in Kyūshū, it was the Sō clan, known subjects of the Shōni, who actually exerted control over these islands. The Sō clan governed Tsushima until the late 15th century. Tsushima was an important trade center during this period. After the Toi invasion, private trade started between Goryeo, Tsushima, Iki, and Kyūshū, but halted during the Mongol invasions of Japan between 1274 and 1281. The Goryeosa, a history of the Goryeo dynasty, mentions that in 1274, Korean troops of the Mongol army led by Kim Bang-gyeong that included many Korean soldiers killed a great number of people on the islands. Tsushima became one of the major bases of the Wokou, Japanese pirates, also called wakō, along with the Iki and Matsuura. Due to repeated pirate raids, the Goryeo dynasty and the subsequent Joseon Dynasty, at times placated the pirates by establishing trade agreements, as well as negotiating with the Muromachi shogunate and its deputy in Kyūshū, and at times used force to neutralize the pirates. In 1389, General Pak Wi (朴威) of Goryeo attempted to clear the island of Wokou pirates, but uprisings in Korea forced him to return home. On June 19, 1419, the recently abdicated king Sejong of Joseon sent general Yi Jong-mu to an expedition to Tsushima island to clear it of the Wokou pirates, using a fleet of 227 vessels and 17,000 soldiers, known in Japanese as the Ōei Invasion. After suffering casualties in an ambush, the Korean Army negotiated a ceasefire and withdrew on July 3, 1419. In 1443, the Daimyō of Tsushima, Sō Sadamori proposed a Gyehae treaty. The number of trade ships from Tsushima to Korea was decided by this treaty, and the Sō clan monopolized the trade with Korea. In 1510, Japanese traders initiated an uprising against Joseon's stricter policies on Japanese traders from Tsushima and Iki coming to Busan, Ulsan and Jinhae to trade. The So Clan supported the uprising, but it was soon crushed. The uprising later came to be known as the "Three-Ports Incident" (三浦の乱 (Sanbo-No-Ran) in Japan and 삼포왜란 (三浦倭亂, Sampo Waeran) in Korea). Trade resumed under the direction of King Jungjong in 1512, but only under strictly limited terms, and only twenty-five ships were allowed to visit Joseon annually. In the late 16th century, Japanese leader Toyotomi Hideyoshi united the various feudal lords (daimyō) under his command. Planning to unite all factions with a common cause, Hideyoshi's coalition invaded Joseon Dynasty Korea in an attack leading to the Seven-Year War. Tsushima was the main naval base for this invasion, and in continuing support of the war, large numbers of Korean prisoners were transported to Tsushima until 1603. In 1587, Toyotomi Hideyoshi confirmed the Sō clan possession of Tsushima. Sō Yoshitoshi (宗 義智, 1568 – 31 January 1615) was a Sō clan daimyō (feudal lord) of the island domain of Tsushima. In 1603, Tokugawa Ieyasu established a new shogunate; and Sō Yoshitoshi was officially granted Fuchū Domain (100,000 koku) in Tsushima Province. After Japan's attempts at conquest failed, peace was re-established between the two nations. Once again, the islands became a port for merchants. Both the Joseon Dynasty and the Tsushima-Fuchū Domain sent their trading representatives to Tsushima, governing trade until 1755. The island was described by Hayashi Shihei in Sangoku Tsūran Zusetsu, which was published in 1785. It was identified as part of Japan. In 1811, for cost reduction, representatives of the Tokugawa shogunate met at Tsushima with ambassadors from the Joseon king (Joseon tongsinsa). In an episode now known as the Tsushima Incident, the Imperial Russian Navy tried to establish a base on the island in 1861, but the effort failed due to British intervention. As a result of the abolition of the han system, the Tsushima Fuchu domain became part of Izuhara Prefecture in 1871. In the same year, Izuhara Prefecture was merged with Imari Prefecture, which was renamed Saga Prefecture in 1872. Tsushima was transferred to Nagasaki Prefecture in 1872, and its districts of Kamiagata (上県) and Shimoagata (下県) were merged to form the modern city of Tsushima. This change was part of widespread reforms within Japan which started after 1854. Japan was at this time becoming a modern nation state and regional power, with widespread changes in government, industry, and education. After the First Sino-Japanese War ended with the Treaty of Shimonoseki, Japan felt humiliated when the Triple Intervention of the three great powers of Germany, France, and Russia forced it to return the valuable Liaodong Peninsula to China under threat of force. Consequently, the Japanese leadership correctly anticipated that a war with Russia or another Western imperial power was likely. 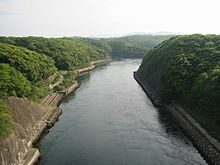 Between 1895 and 1904, the Imperial Japanese Navy blasted the Manzeki-Seto canal 25 metres (82 feet) wide and 3 metres (9.8 feet) deep; it was later expanded to 40 metres (130 feet) wide and 4.5 metres (14.8 feet) deep (Nagasaki prefectural website) through a mountainous rocky isthmus of the island between Asō Bay to the west and Tsushima Strait to the east, technically dividing the island into three islands (topographical map). Strategic concerns explain the scope and funding of the canal project by Japan during an era when it was still struggling to establish an industrial economy. The canal enabled the Japanese to move transports and warships quickly between their main naval bases in the Seto Inland Sea (directly to the east) via the Kanmon and Tsushima Strait into the Korea Strait or to destinations beyond in the Yellow Sea. An Imperial decree in July 1899 established Izuhara, Sasuna, and Shishimi as open ports for trading with the United States and the United Kingdom. During the Russo-Japanese War in 1905, the Russian Baltic Fleet under Admiral Rozhestvensky, after making an almost year-long trip to East Asia from the Baltic Sea, was crushed by the Japanese under Admiral Togo Heihachiro at the Battle of Tsushima. The Japanese third squadron (cruisers) began shadowing the Russian fleet off the tip of the south island and followed it through the Tsushima Strait where the main Japanese fleet awaited. The battle began at slightly east-northeast of the northern island around midday, and ended to its north a day later when the Japanese surrounded the Russian Fleet. Japan won a decisive victory. From 1948 to 1949, the Jeju Uprising, and its resulting suppression and massacre by anti-communist Korean forces, many Jeju residents fled and took refuge in Tsushima. In 1950, the South Korean government asserted sovereignty over the island based on "historical claims". Korea-US negotiations about the Treaty of San Francisco made no mention of Tsushima Island. After this, the status of Tsushima as an island of Japan was re-confirmed. While the South Korean government has since relinquished claims on the island, some Koreans (including some members of the Korean parliament) have periodically attempted to dispute the ownership of the island. In 1973, one of the transmitters for the OMEGA-navigation system was built on Tsushima. It was dismantled in 1998. Today, Tsushima is part of Nagasaki Prefecture, Japan. On March 1, 2004, the six towns on the island, including Izuhara, Mitsushima, Toyotama, Mine, Kami-agata, and Kami-tsushima, were merged to create the city of Tsushima. About 700 Japan Self-Defense Forces personnel are stationed on the island to watch the local coastal and ocean areas. Tsushima is administered by Nagasaki Prefecture. The South Korean city of Changwon also asserts ownership of the Island, calling it Daemado (Korean pronunciation: [te:ma.do]; Hangul: 대마도; Hanja: 對馬島; RR: Daemado; MR: Taemado), the Korean reading of the characters used in the Japanese name (Japanese: 對馬). Early, the central government in South Korea made official claims to the island since 1948. Those claims are dubious and have been debunked. Archaeological evidence suggests that Tsushima was already inhabited by settlers from the Japanese archipelago from the Jōmon period (14,000 BCE) to the Kofun period (300 CE). Also, according to the Sanguo Zhi in the 3rd century Tsushima was Tsuikai-koku and one of the 30 that composed the Yamataikoku union countries (邪馬台国). This island, as Tsushima Province, has been ruled by Japanese governments since the Nara period (710 CE). According to the Korean history book Samguk Sagi written in 1145, Tsushima is ruled by the Japanese from CE 400. In June 19, 1419, Japan repelled the Ōei Invasion of the abdicated king Sejong of Joseon. He sent general Yi Jong-mu to an expedition to Tsushima island to clear it of the Wokou pirates, using a fleet of 227 vessels and 17,000 soldiers. The Joseon invaders suffered casualties in an ambush and the Korean Army negotiated a ceasefire and withdrew on July 3, 1419. The Tsushima Fuchu domain became part of Izuhara Prefecture in 1871. In the same year, Izuhara Prefecture merged with Imari Prefecture, which was renamed Saga Prefecture on May 29, 1872. The island provinces of Tsushima and Iki were merged with the western half of the former province of Hizen and became modern-day Tsushima, Nagasaki Prefecture in 1872. The South Korean government made a claim in 1948, but it was rejected by Supreme Commander of the Allied Powers (SCAP) in 1949. On July 19, 1951, the South Korean government agreed that the earlier demand for Tsushima had been dropped by the South Korean government with regards to the Japanese peace treaty negotiations. The status of Tsushima as an island of Japan was re-confirmed in 1965. In 2008, Yasunari Takarabe, incumbent Mayor of Tsushima rejected the South Korean territorial claim: "Tsushima has always been Japan. I want them to retract their wrong historical perception. It was mentioned in the Gishiwajinden (魏志倭人伝) (a chapter of volume 30 of Book of Wei in the Chinese Records of the Three Kingdoms) as part of Wa (Japan). It has never been and cannot be a South Korean territory." ^ MapQuest on Tsushima Island's coordinates. ^ "Google Maps". Retrieved 2008-05-02. ^ Nicol, C.W., "Hark ye to the Donkey's Ears", Japan Times, March 7, 2010, p. 12. ^ Gloydius tsushimaensis at the Reptarium.cz Reptile Database. Accessed 14 February 2015. ^ a b Kaneko, Maya, (Kyodo News) "Tsushima's S. Koreans: guests or guerrillas? ", Japan Times, March 5, 2010, p. 3. 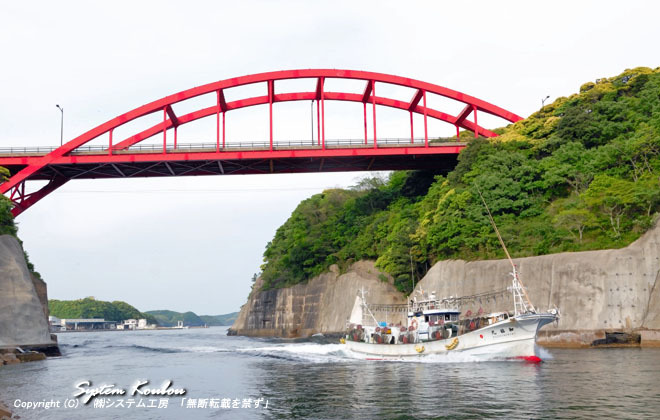 ^ "Official announcement of Tsushima tourism association". Archived from the original on 2013-08-20. Retrieved 2013-08-21. ^ "朝鮮王朝実録世宗4卷1年7月9日" Annals of the Joseon DynastyKing SejongVol.4 July 9  "세종 4권, 1년(1419 기해 / 명 영락(永樂) 17년) 7월 9일(임자) 5번째기사이원이 막 돌아온 수군을 돌려 다시 대마도 치는 것이 득책이 아님을 고하다"
^ Tsushima tourist Association WEB site "1443　嘉吉条約（発亥約定）- 李氏朝鮮と通交条約である嘉吉条約を結び、歳遣船の定数を定める。これにより、宗家が朝鮮貿易の独占的な地位を占めるようになる。"
^ Papinot, Jacques. (2003). Nobiliare du Japon -- Sō, p. 56; Papinot, Jacques Edmond Joseph. (1906). Dictionnaire d'histoire et de géographie du Japon. ^ Klaproth, Julius. (1832). San kokf tsou ran to sets, ou Aperçu général des trois royaumes, p. 96; excerpt, "... et vis-à-vis de l'île de Toui ma tao (Tsou sima) qui fait partie du Japon ...."
^ Lewis, J.B. Frontier contact between Chosŏn Korea and Tokugawa Japan, page 30. ^ "U.S. State Department, Report from the Office of Intelligence Research: Korea´s Recent Claim to the Island of Tsushima (prepared on March 30, 1950)"; retrieved 2013-4-2. ^ "Memorandum of Conversation, by the Officer in Charge of Korean Affairs in the Office of Northeast Asian Affairs (Emmons)," Foreign Relations 1951, Vol. VI, pp. 1202-1203; excerpt, "Mr. Dulles noted that paragraph 1 of the Korean Ambassador's communication made no reference to the island of Tsushima and the Korean Ambassador agreed that this had been omitted." ^ a b US Bureau of the Census (1965). Foreign Commerce and Navigation of the United States, p. lv. ^ "Ordinance of Day of Daemado in Changwon". Enhanced Local Laws and Regulations Information System (in Korean). 2012-12-28. Retrieved 2015-01-01. ^ "Japan ponders law banning foreigners buying land near to military sites". South China Morning Post. 2013-10-29. ^ 三国史記(Samguk Sagi) 巻三　新羅本記　三　實聖尼師今条 "七年、春二月、王聞倭人於対馬島置営貯以兵革資糧、以謀襲我　我欲先其末発　練精兵　撃破兵儲"
^ "【動画】竹島問題で韓国退役軍人が抗議 対馬市民反発で現場騒然". The Nagasaki Shimbun. July 24, 2008. Archived from the original on September 4, 2012. Retrieved May 15, 2011. Ian Nish, A Short History of JAPAN, 1968, LoCCC# 68-16796, Fredrick A. Praeger, Inc., New York, 238 pp. British Title and Publisher: The Story of Japan, 1968, Farber and Farber, Ltd.
Edwin O Reischauer, Japan - The Story of a Nation, 1970, LoCCC# 77-10895 Alfred A. Knopf, Inc., New York. 345 pp. plus index. Previously published as Japan Past and Present, 4 Editions, 1946–1964. Wikimedia Commons has media related to Tsushima. Wikisource has the text of the 1911 Encyclopædia Britannica article Tsu-shima.